Graphene, the much-hyped 2D matrix of carbon atoms arranged in a honeycomb lattice, is the lightest, strongest, thinnest material known to man, as well as the best heat and electricity conductor ever discovered - and the list does not end there. Graphene is the subject of relentless research and is thought to be able to revolutionize entire industries, as researchers hypothesize many potential kinds of graphene-based materials and applications. The excitement surrounding graphene soared since Sir Andre Geim and Sir Kostya Novoselov were awarded the 2010 Nobel Prize in Physics, "for groundbreaking experiments regarding the two-dimensional material graphene". Geim and Novoselov extracted graphene from graphite, using the "scotch tape" method, to obtain a piece of graphene (or carbon) one atom thick. While winning the prestigious prize was definitely an impressive hallmark, this was not the first time graphene stood at the center of scientific attention. Graphene has a long history behind it, and had already been in awareness since the nineteenth century, in fact. English chemist Benjamin Collins Brodie recognized the highly layered nature of thermally reduced graphite oxide as early as 1859 having reported the atomic weight of graphite in the Philosophical Transactions of the Royal Society of London that year. Much additional graphene research took place since then, and the 1947 work by P.R. Wallace is a good example - he predicted the electronic structure and noted the linear dispersion relation. 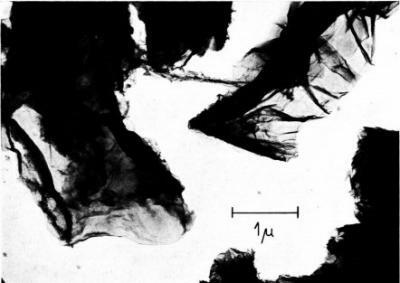 Later on, in 1962, Boehm and colleagues had published details of their work on graphite flakes. They isolated and identified single graphene sheets by transmission electron microscopy (TEM) and X-ray diffraction in 1961. The term “graphene” was first used in 1987 to describe single sheets of graphite, and it was also used in early descriptions of carbon nanotubes. In the early 1970s chemists figured out how to deposit carbon in graphene monolayers onto other materials. Andre Geim, Konstantin Novoselov and their collaborators from the University of Manchester (UK), and the Institute for Microelectronics Technology in Chernogolovka (Russia), presented their results on graphene structures in October of 2004, in a paper that described the fabrication, identification and Atomic Force Microscopy (AFM) characterization of graphene. They used a simple mechanical exfoliation method for extracting thin layers of graphite from a graphite crystal with scotch tape and then transferred these layers to a silicon substrate. Furthermore, they managed to pattern samples containing only a few layers of graphene into a Hall bar and connect electrodes to it. Many voices were heard surrounding the Nobel committee's decision to grant the 2004 graphene-related prize, and disputes over the history of the field ran rampant. Several scientists alleged factual errors in the Nobel committee's reasoning as it was published and the website was subsequently updated. Others suggested that the award was premature and that perhaps work by other scientists should have been incorporated into the Prize. Some researches pointed out similar or competing achievements that pre-dated the Nobel work. The Nobel committee, however, gave the award in recognition of groundbreaking experiments, not the "discovery" of graphene. Moreover, many have pointed out that it is the freestanding nature of the Nobel graphene (in contrast to the supported and bonded sheets of earlier work) that made it prize-worthy. In Geim's Nobel Prize lecture, he suggests that his and Novoselov’s 2004 paper marked the first time that a single atomic layer of carbon had been isolated in a totally unambiguous way, and he repeats the known suggestion that there was some reason before that to think graphene might not be stable (before 2004, graphene was presumed by some not to exist in the free state and regarded as unstable). “This is probably why it took so long for graphene to be isolated,” he says. Boehm, the above-mentioned scientist involved in graphene research, said that in his view, the Nobel committee “has not exercised the care expected for such a decision”. But he nevertheless believes that the award can be justified by Geim and Novoselov’s electronic measurements on graphene. “These were certainly new with, in large part, unexpected results,” he says. Regardless of its convoluted history, graphene is a fascinating material that holds great promise, which is gradually becoming a reality as companies and researchers are working tirelessly to design techniques for producing, using and applying graphene in everyday products. 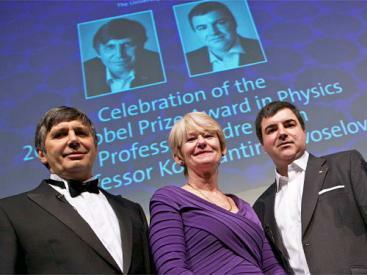 Andre Geim and Konstantin Novoselov grab the 2010 Nobel prize in Physics!